We were featured on St. Louis Public Radio!!! Living Arts is featured on KDHX's website! GOOD NEWS, WE'RE IN THE NEWS! Our recent collaboration with Shakespeare In The Streets (SITS) has sparked some talk! Our recent exhibition housed at Sheldon Concert Hall also got some attention. Click on the links below to read about our accomplishments (FYI, some tears might be shed in the reading of the STL Magazine article, we suggest you grab a tissue in advance...). partnering with SHAKESPEARE IN the streets! We are very excited to announce our partnering with Shakespeare in the Streets (SITS). Our collaboration focuses on puppet design and making. For the past two months, we have been woking side-by-side with the staff of the festival to create human-like puppets that will be used as major props in the upcoming festival shows September 16-18 2016 in Maplewood, MO. Make sure you check out our Facebook and Instagram for visual updates about this collaboration! See you at the festival! We have created an anthology in conjunction with THE BRIGHTEST CORNER exhibit. It showcases artwork as well as Q&A's from the participating artists involved in the show. Click here for more info. It's a great little buy! Perfect as a gift or coffee table read! Living Arts celebrated their second collaboration with the Saint Louis Art Museum in February. In conjunction with the exhibition Currents 111: Scouts or Sports?, artists Steven and William Ladd worked with over 600 participants from the Saint Louis community for the Saint Louis Art Museum Scrollathon. Community members collaborated with the artists to make a group installation, as well as an individual scroll to keep, and were each photographed for a portrait mural to document their participation. The group installation, shown below, was titled Crème de la Crème Because It's the Best Of The Best. Living Arts is proud to announce their first collaboration project with The Saint Louis Art Museum. 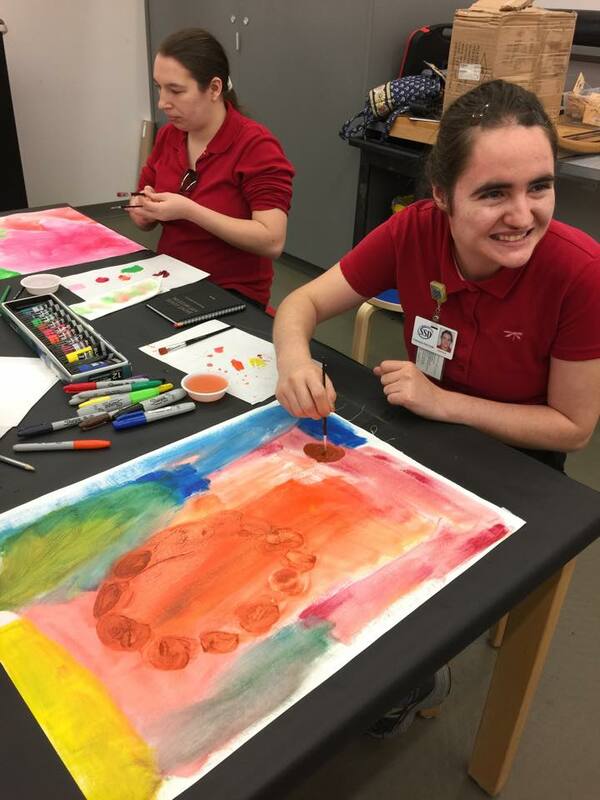 Together, Living Arts and SLAM joined forces to create one-of-a-kind art classes lead by professional artist living with disabilities. Each artist focused on teaching their philosophy and art skills to participants. Participants have included high school students and young adults living with disabilities who are transitioning into the work force. Artists Mililani Perry, Michael Weidle, and Steven Proski taught the classes. We can't wait to plan more! Alongside the Living Arts studio, Bridges Community Support Service has also opened a cafe in the heart of Maplewood called The Living Room. It specializes in single origin coffees and provides work opportunities for people with disabilities. Luckily, serving delicious coffee and locally sourced eats are not the only thing the cafe offers. Fortunately for us at the studio, the cafe serves as a beautiful, community-oriented gallery space and has exhibited the work of a Steven Proski, a professional KC artist and is currently exhibiting the work of St. Louis based artist Gus McClean.